How do I display the pathname to the BASH shell? How do I display the pathname to the BASH shell of the Linux Terminal? Are there any web version of Delphi? Are there any web version of Delphi? It is because I cannot install the Delphi from my portable harddrive to the public computers. Could you tell me what is / are wrong of the coding? Re: Could you tell me what is wrong or missing for my coding? Thank you for your kind help and I have a new question. I have followed the demo to do the same thing but it does not work. Please help me to have a look. Thank you for your help at the last time. I have tried to re-do the question by myself. Could you tell me what is wrong or missing for the attached document? Thank you for your kind reply but could you tell me how can I change to For Loop? Could you explain, why in your [U]Example3.zip[/U] the method [B][I]procedure TForm1.Button1Click(Sender: TObject);[/I][/B] is not assigned with the Event of [U]Button1[/U] [B][I]OnClick[/I][/B] ? May be you did not try it ? How can I use a For loop and a TImage components to produce the animation? The result is the same. It does not help. I found that Delphi6 is not suitable to work on these exercises. Could you tell me what software(s) is / are suitable? Thank you for your help but it does not work as well. I forget to attach the document. Could you tell me what is wrong or missing for my coding? Re: Please let me know what is wrong or missing for it. Thank you for your kind reply and help. But could you mind tell me why I cannot put 'for count := 1 to 10 do' to the program? Could you tell me how to do for it? One of the zip is the demo2.zip and the other is my work. Please give me some of the ideas. Please let me know what is wrong or missing for it. Re: How can I start to VCL Forms Application? Thank you for your kind help but the screen is total different between Delphi6 and Delphi IDE. I have tried to open my classwork at my computer but I do not know why I cannot change the size of the image and many of the things. Please give me some of the ideas to do it. Unit1 will contain all the methods about Form1. How can I start to VCL Forms Application? Hi. Long time no see. How are you? I have come back to Programming class already. Could you tell me how can I start to VCL Forms Application if I use Delphi6? Re: Could you tell me what I can do to solve the problem? The restore kit is inside the harddrive but it does not go to the screen of Window. After discussing with the support from American Region. She advise me to buy back the restore CD from New Zealand / Australian Region. I have tried to call the 0800 phone on yesterday but it does not work because I am not in New Zealand now. When I tried to call the support of Australia. She is on a holiday in this moment until 7 January. So, what can I do in this moment. Have you got the restore CD? Could you tell me what I can do to solve the problem? I have bought a PC COMPAQ CQ2000AN in New Zealand. That model does not provided the restore kit in CD formation. I know the restore kit which is installed into the harddrive but now the PC was not work and cannot go to the windows screen and DOS prompt. I have tried to call the support of HP at Australia but she is on a holiday until 7th January, 2010. Could you tell me what I can do to solve the problem? I am not in New Zealand. Re: Could you tell me how can I do this kind of question. Thank you for your prompt reply. Yes, I want to calculate the value of the variable (evens). Just follow the source code in my head, or on paper. But how can I do in this way? Maybe, it is not useful for me to work on the computer for this kind of question. It is the attached document. Could you tell me how can I do this kind of question. Could you tell me how can I do this kind of question if I do not working with the computer and please find the attached document for your reference - it is the answer of the question? What is wrong of my program? How can I add some music for it? How can I change the colour of the font and display into screen? IT113 Assignment - Who wants to be a student millionaire. Re: How can I write a program that writes to a text file? Thank you for your kind reply. I am using Borland Delphi but what is TFileStream? How can I write a program that writes to a text file? 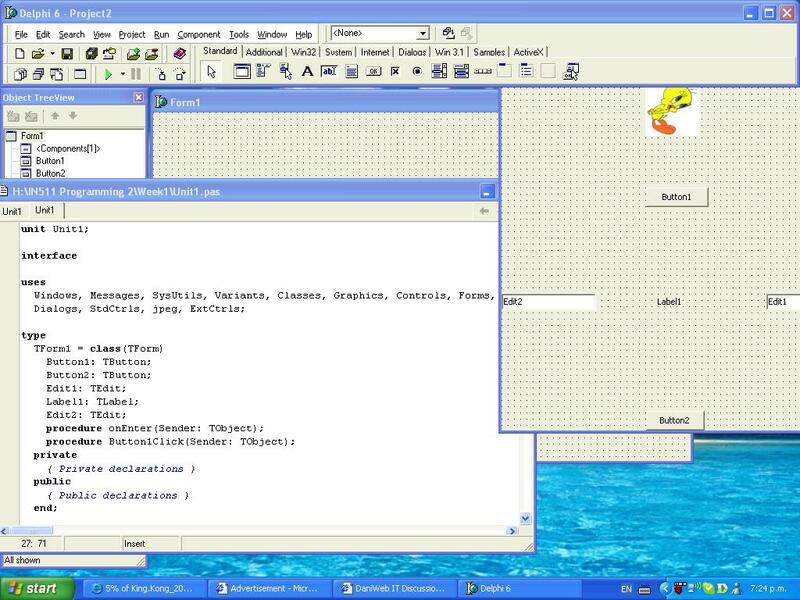 Could you tell me how can I write a program that writes to a text file, the 32 people that are in our hotSeat.txt file. How can I list the sorted results on the screen? Could you tell me how can I read from the hotseat.txt file all the records and sort by first name. Finally, list the sorted results on the screen. Re: Could you please give me some of the idea of making the hotSeat game in pascal? I am still thinking what I want to do for the coding. Can I do in the following way? ?